Enjoy our full buffet selection of fruits, cereals, yogurts and fresh baked breakfast breads, hot items and made-to-order eggs and omelets, juices, coffee or tea. 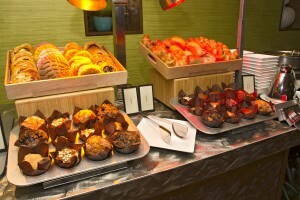 Enjoy our selection of fruits, cereals, yogurts, fresh baked breakfast breads from the buffet with juices, coffee or tea. Cheddar, mozzarella, sausage, bacon, ham, spinach, onions, bell peppers, mushrooms, tomatoes. Made with your choice of whole eggs or egg whites served with choice of breakfast potatoes or cut fresh fruit and toast. Three egg omelet with chorizo, jalapeños and queso fresco with cilantro breakfast potatoes. Choice of toast, flour or corn tortillas. Two poached eggs and chorizo on a toasted English muffin dressed with hollandaise sauce and served with lyonnaise red skin potatoes topped with queso fresco. Prepared to order with your choice of bacon, sausage links or fresh fruit served with breakfast potatoes and toast. For guests with food allergies or specific dietary requirements, please ask to speak to a Manager. *Consuming raw or undercooked eggs or meat may increase your risk of foodborne illness.